You’re ready to propose to her, you have the suave Casanova script down pat, you’ve reserved a special table in the metropolis’ most romantic restaurant but you’re helpless in one aspect – the ring. Though some brides-to-be accompany their grooms in buying this one important symbol of love, it wouldn’t hurt to also bring along this helpful article when you go ring-shopping. There are three types of metal popular for rings: yellow gold, white gold and platinum. Yellow gold is said to be the traditional ring metal, with 14karat and 18karat as the often-heard phrases attached to it. What is their difference? The higher gold content in 18karat rings makes it pricier but the over-all quality and color is about the same. White gold is a mix of gold and white metal alloys such as nickel and palladium. Rhodium plating is done to make the gold look whiter. White gold is harder to work with than yellow gold hence it is more expensive. The most expensive and most preferred nowadays of the lot is platinum. Platinum is the hardest of the precious metals, it never tarnishes. Its intense luster remains intact over the years, and it is said to be completely hypoallergenic. The setting is how the stone or stones are held in place in the band. The most classic and traditional setting is the solitaire. A single diamond is set on usually four to six prongs. A four-prong setting displays the diamond more while six prongs hold the stone firmly in place. The channel setting is popular for wedding bands. A row of stones is sandwiched horizontally on the ring band. The bezel setting is for those with contemporary tastes. A metal rim with straight or scalloped edges fully or partially surrounds the stone which looks embedded into the band. Another popular setting is the pave, which has rows of several stones set in level with the surface of the ring. This adds extra sparkle to the main stone. Of course, the diamond remains to be the perennial favorite. Though there would be modern brides-to-be who prefer to have other stones complementing the diamond, such as sapphires and rubies. 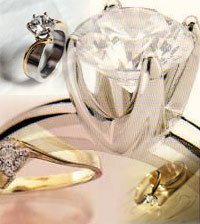 In choosing your stone, remember that round-shaped stones produce more sparkle. The contemporary stone shape is said to be the square princess cut whose intricate faceting results into added sparkle. The oval shape is an old favorite, it is a variation of the round shape. The pear shape is cut like the round shape but it has an extra pointed tip at the top. Lastly, you couldn’t be more obvious with your undying love with the heart shape. You’ve heard them associated with diamonds a few times. Now that you’re shopping for the perfect engagement ring, it wouldn’t hurt to know more about these 4 Cs. Cut refers to the number, placement, and shape of the facets. This affects the durability, sparkle and fire or reflection of colors of the diamond. Color – Diamonds do not only come in white, although it is said that the whiter the diamond, the better. However, if you want to surprise your modern bride with a pink diamond, then do so! Clarity refers to how clear the or clean the diamond is. It is better if it is free of blemishes which includes chips, scratches and fractures. It should not also have inclusions or flaws on the inside. For more information, refer to the chart of the Gemological Institute of America or your favorite jeweler. Lastly, the carat – the diamond’s unit of weight. It is different from karat which is used for gold. The diamond’s carat is standardized at 200 milligrams. Still stumped? Don’t be afraid to ask for help from your jeweler. Trust your instincts, usually, the ring that will make your heart race at sight will surely make her say “Yes!”. Happy shopping!